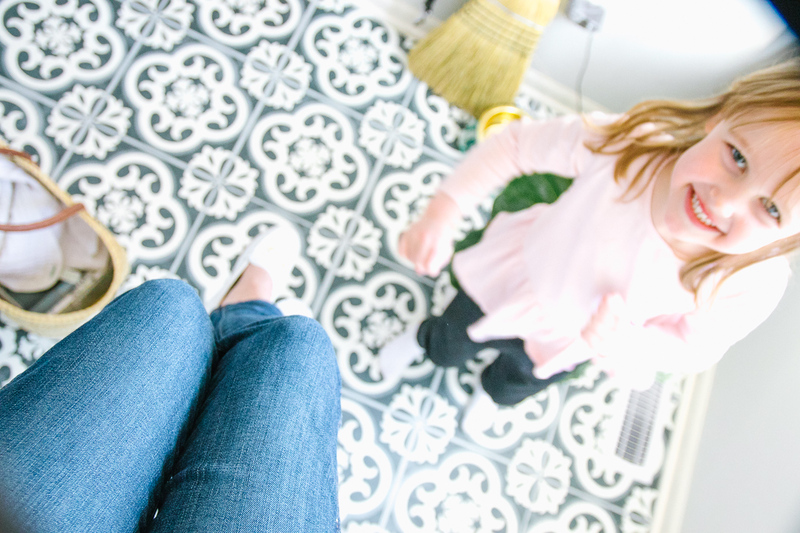 Our laundry room floor finally got a makeover…. The best part? It was easy to install ourselves (only took about an hour), NO construction was involved AND it was very affordable. We used vinyl tiles from Floor Adorn that we simply applied over our existing flooring. 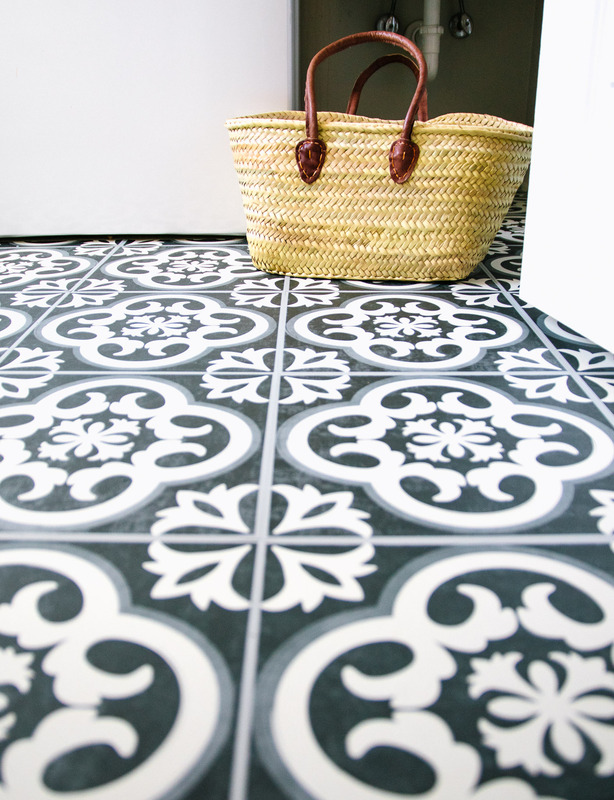 Honestly, I had been skeptical about peel and stick tile in the past but Floor Adorn has changed my mind! 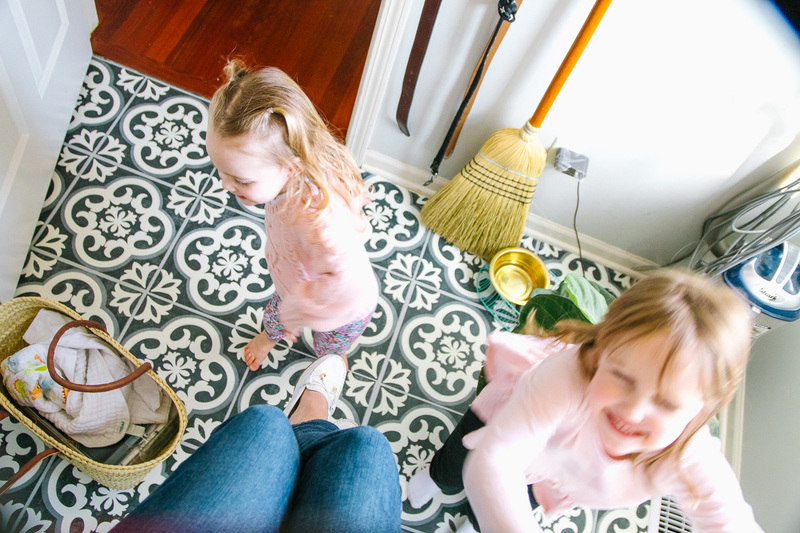 I’m sharing some details on our experience with the tiles, answering a few questions, and including a link below to purchase too! 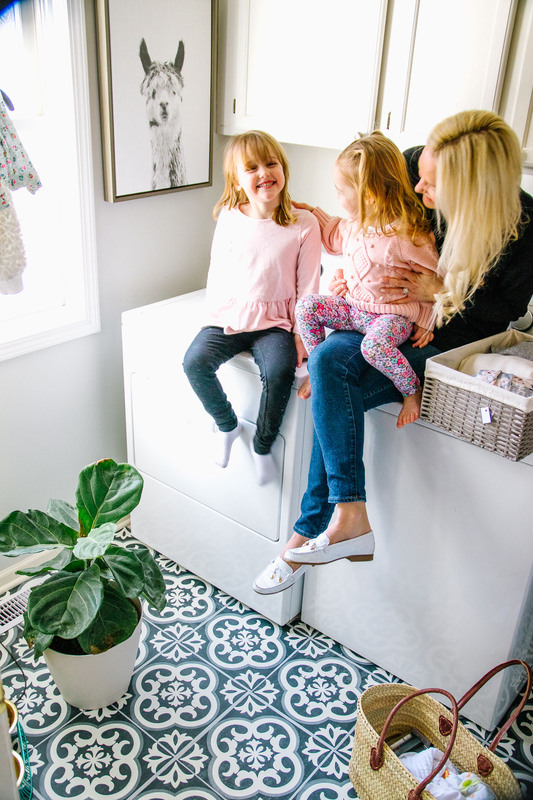 But first, here’s a few photos from our little laundry room photo shoot. PS. our laundry room is never this clean haha so had to document while it lasted!! How durable are the tiles? They have held up great for us so far! They are designed for high traffic areas so I expect they will last awhile. EASY. It literally took just over an hour to do the entire floor. The only tricky part was cutting the tiles around a couple awkward corners. I used an X-ACTO knife a ruler to help. How do they look in person? I’ve shown them off to a few family members and friends and EVERYONE has been shocked at how good they look in person. Unless you get up close, you would think these were real tile. The Floor Adorn tiles are thin (like a heavy sticker) but you wouldn’t be able to tell at all once they are on the floor. I’ve had a cement floor tile sample with a similar pattern sitting in our laundry room for over a year (seriously, maybe almost 2 years!!). I finally was able to achieve the look I wanted without having to rip out the flooring and install the cement tiles. Will it ruin the floors? We installed this over a linoleum floor which a very smooth and durable surface. I was able to easily pull the tiles up and reposition them. No damage at all. I’ve tested them on our wood floors too and can’t imagine how they would damage those. The tiles are created to be removable and not ruin any type of flooring. They are $59 for a set of 6. Above, I used a total of 36 tiles. 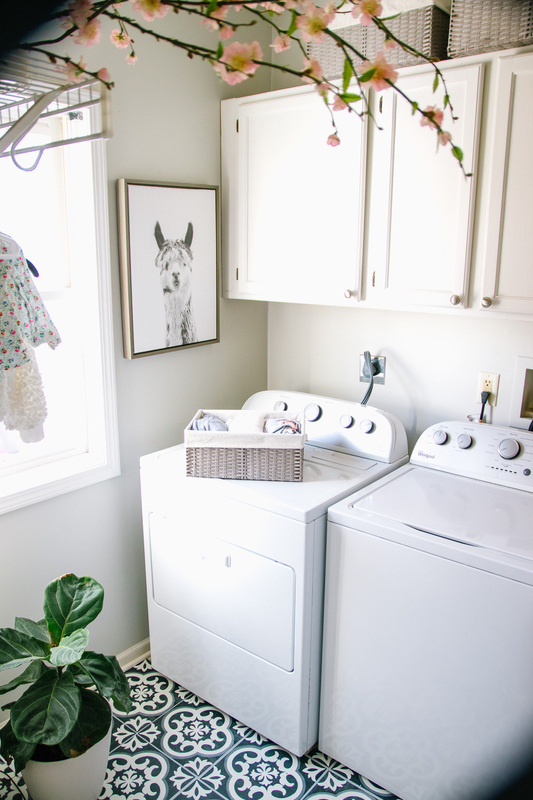 The laundry room is 7’x8′ but since the washer and dryer cover a good portion, I was able to get away with only using 36 total. 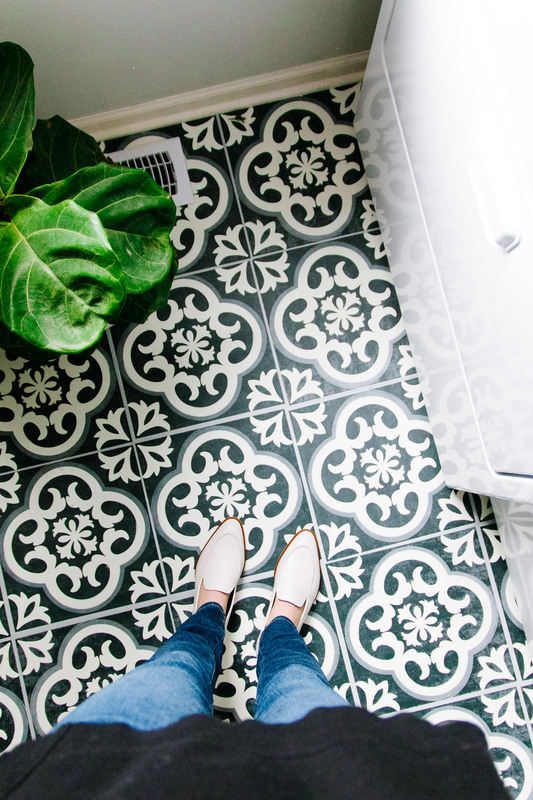 Also, if you are subscribed to my blog, Shining on Design, AND send me a message (either comment or private message is fine), I will enter you into a giveaway to WIN 2 packs of the floor tiles (valued at $120). I’ll select the winner on April 15th and post it in real time on my instagram stories. Winner is responsible for shipping costs. I did a giveaway this way in a recent post, an easy switch to upgrade your home, and it was a hit! 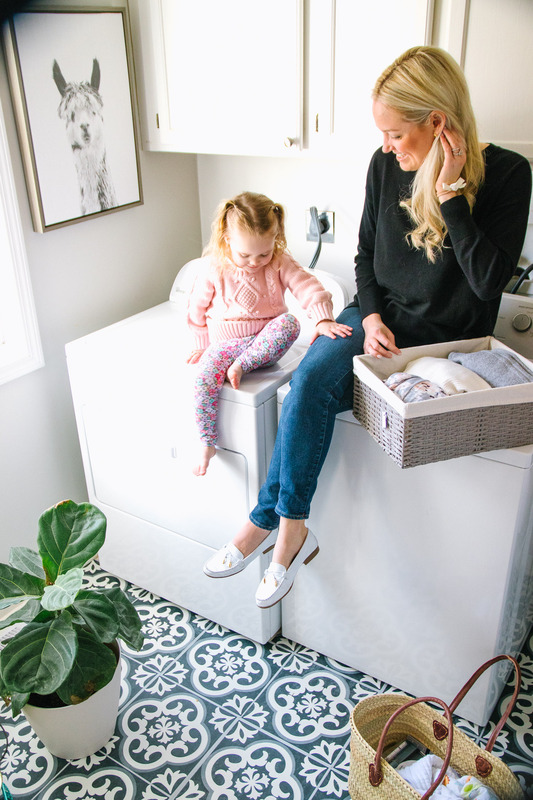 Lastly, in case you missed it, be sure to check out other favorite items from the International Home and Housewares Show! UPDATE 4/16: GIVEAWAY IS CLOSED. Winner has been notified, thanks all for entering! ← Brand New Home & Housewares Items You’ll LOVE! I love the design!! It really stands out. 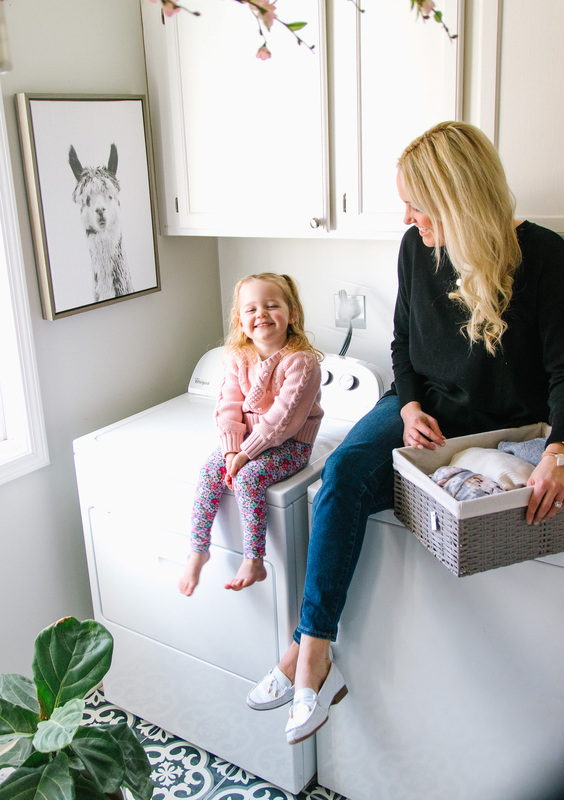 We have a smaller size laundry room too. Love it!!! My husband and I are in the process of purchasing our first home and already planning the renovations!! So exciting!!! And – CONGRATS!!! 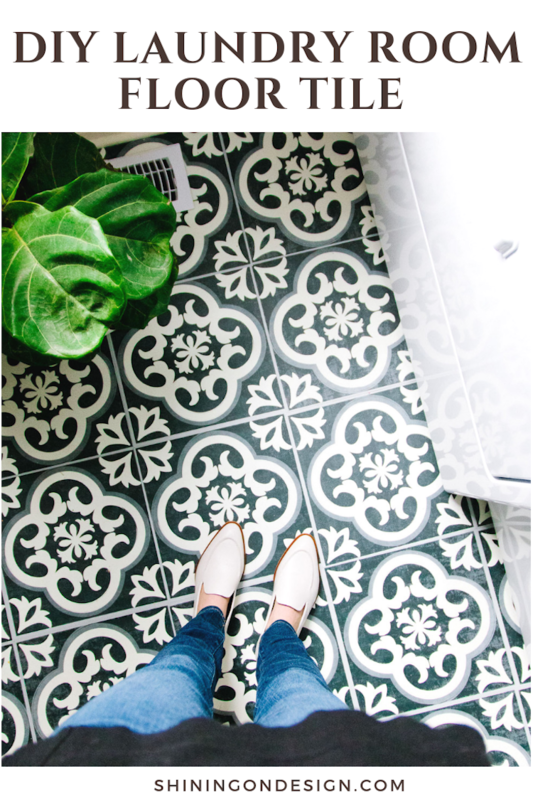 I’ll send you an e-mail so we can get the tiles to you asap – thanks Staci! This is so nice and I’d love to use it in one of my rooms. (I am subscribed vie email). Thanks Annette! They are great for so many spaces! 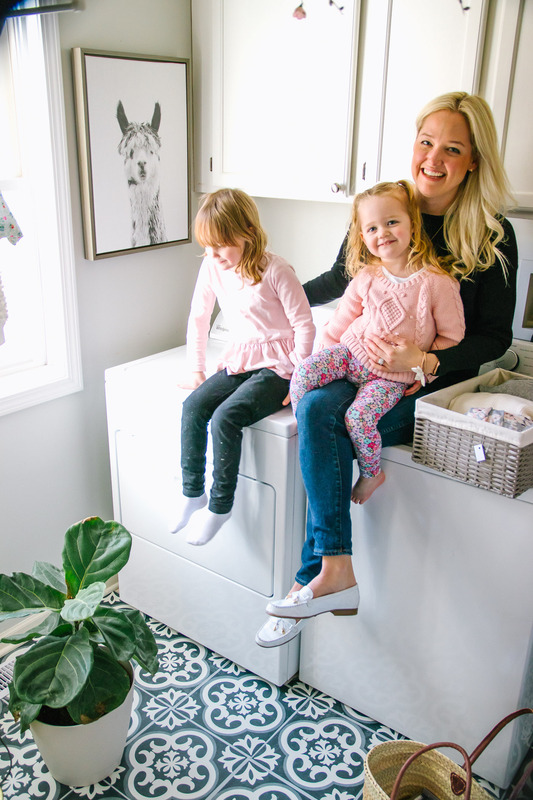 These would be perfect for our laundry room! We have wanted to update the floors for awhile. I’d love to try these tiles! Great post!